A little platform peep toe with rosettes on the side. Don't forget to throw a little sparkle all over. whoa, those are some serious stunners! gorgeous! 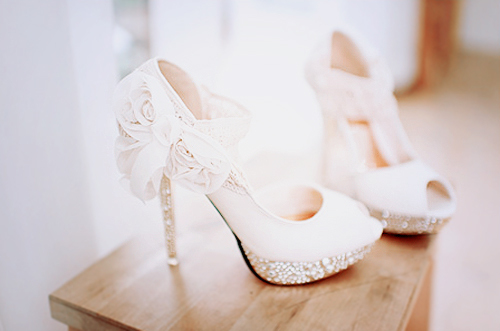 Beautiful shoes and very Cinderella like but the shoes are really high. OH MY GOD! I WANT THOSE SHOES SO BAD!!!!!! Oh WOW!! I love those shoes!!! I need these shoes! Who are they by? shoes are just awesome, but bit high. Who are those shoes by? I want them! Please tell me where to find these!! Has anyone found out where to find these shoes? Really need to know who makes these! Where can I get these I've been searching like crazy!! I'm in love!!!! does anyone know who makes these shoes? I have to have these for my wedding..anyone know where to find these or who makes them? ?